Despite all being about meet cutes (quirky/funny/cute situations in which a future romantic couple meets for the first time), a lot of them really stood out as something different and made me want so much more. I also loved all the LGBT couples in there, and the completely diverse cast. I wasn’t a big fan of the writing style used in this story (it was in second person, which isn’t a favorite of mine). It was fun though, and I did enjoy some parts of it. Although I did laugh when they said Wolf had one of the last family run farms in New York. I live on Long Island, and there are thousands of family run farms. There are two farms just right next to my house. The local high school has a tractor day where everyone drives their tractor or truck to school. I love Katie Cotugno, but she clearly doesn’t know just how rural New York is once you get about an hour (sometimes less) from the city. The writing style in this short story also wasn’t my favorite, but I loved the plot and the idea behind it. I also loved that it was a lesbian romance. This story just wasn’t my favorite. I loved the diverse cast and how it dealt with racism, but I wasn’t a big fan of any of the characters in it, and the one character I thought I’d like was introduced in the last couple of pages so we didn’t even get to know him. However, I am interested in other things Ibi Zoboi has written. This story had such a great premise, and I really want to delve further into it. I loved how it was in the future, but only 2020, and the technology has developed just enough to make it slightly interesting but still realistic. It was a really fun read. I used to read all of Sara Shepard’s books, and even though I’ve fallen behind in her work, this story just reminds me how much I love her writing style. It wasn’t the perfect story, but I did really enjoy it. As a theater person who puppeteered the Audrey II in Little Shop of Horrors, I was very excited when I saw the title of this one, and it managed to live up to my expectations. This story had a transgender protagonist who is fighting her school for bathroom and locker room rights. I really loved the message and the romance was adorable. When I read this one, I wasn’t its biggest fan. I did enjoy it, and looking back it was really well written and the premise is interesting, but while reading I found myself really confused. I think this could have benefitted from being a little bit longer. If it was explained more and had even just one more chapter, I would have loved it a lot more. I really did like the idea behind it! This was freaking adorable oh my god. I absolutely loved it. A lesbian meet cute in an airport with marvel references? It was like it was made for me. This is one I definitely want more of. Of course Jennifer L. Armentrout’s is my favorite. It’s Jennifer L. Armentrout. This story was adorable, funny, and just perfect. Although I may be biased because I work at a library… Either way, I need more of this story. Can she just write this as a full length novel? Please? It was amazing. As a math person, this one was really fun for me. I have a habit of calculating random statistics in my head, and in this, the girl is just making it into a school project. I found myself laughing a lot in this, especially when it came to her classmates being curious about the project. This was just really fun and lighthearted, and even felt like the perfect length. This story was interesting, and was definitely different than the others. I did enjoy it, but I did find some parts not that believable (which is understandable). In the end, it was a good read. Something Real was cute and entertaining, and while I love stories with a lesbian twist, it just wasnt my favorite. It just didn’t click with me. The plot of this story was really cute, which made up for the fact that I didn’t love the writing style. While I love Huntley Fitzpatrick and her work, I’m still not a big fan of 2nd person in YA. Luckily, in this story it didn’t seem as noticeable as the first one. This story was really interesting. I found myself less interested in the romance and more in the world and the surroundings (which is rare for me, usually the romance in my #1 priority). I would really love another look into this world and to see what all the other departments are like. More evidence of Nicola Yoon’s amazing-ness. Pros– Lots of unique, cute stories. Diverse, couples of every race and gender. Cons– Some short stories lacked in the characters and setting department, or didn’t have enough time to really explain the concept behind the story. Also, a few authors experimented with writing styles that weren’t really for me. 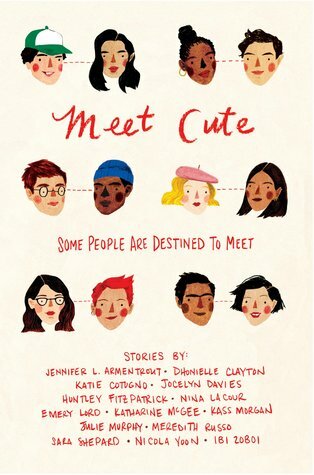 Meet Cute is a fun and cute read, with some stories being stars and other slightly dull.